It’s lucky Margo T Krasne has a sense of humor, since at the start of her book I Was There All Along, she’s contemplating jumping out a seventh story window — only stopping when she realized it would have only been four floors down. Good thing too, otherwise Margo’s adventures — in bed and out — and her many achievements — being an actress for a bit, a successful radio producer, a sculptor (her works are remarkable and totally deserve a gallery show!) and a very successful communications coach, would be left untold! Although she’s always felt that her life was a series of ‘almosts’, her memoir shows otherwise and captures the reader’s attention from the start. Margo’s almosts are usually far more accomplished than most people can attain in their lives. Her easy style is such that you find yourself wishing to have dinner with her and listen to her as she recounts tale after tale. Even though she often felt peripheral to “where the action was”, this true-blue, dyed in the wool New Yorker connected with so many greats and near-greats that her stories never fail to intrigue. Some make you laugh, others weep, but they all ring true and you truly know that Margo was there all along! 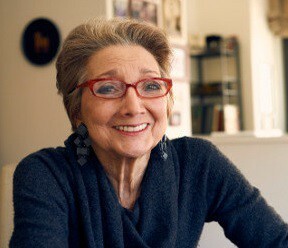 We managed to sit down and speak frankly and candidly to Margo about her book, her writing, her many careers, and life in general. It’s often difficult to recollect an entire life and put it all on paper. Did you find yourself editing quite a bit from “I Was There All Along”? Oh, yes. I rewrote the book almost from scratch three times. Again, I had to keep reminding myself what the reader would care about, and not just what I needed to get off my chest. So a lot of early childhood stuff went into the shredder, probably where it should have been to begin with. Do you remember any favorite childhood books? All I can remember is having a flashlight under my blankets so I could keep reading whatever I had started. I am sure they all had to do with unrequited love — but that would make sense considering my history. You’ve had several distinct career paths, and have now started on your next one. Without giving away too much of your memoir, what have you learned in each career that you’ve taken with you to the next? My niece, after reading my book, said she’d had no idea how difficult all the transitions were and what my life had actually been like. I was surprised. I thought the travails were obvious. I guess the answer to your question is that I have taken me from one career to another. That was what gave me the idea for the title of the book. Does writing energize or excite you? Both! It starts with an opening, something that starts me off. The energy holds until I go back and rethink each sentence until I’m sure every word is there for a reason. Often I have to walk away so that I can come back and see the page afresh. Much like with crossword puzzles to which I’m addicted. So, like any writer, you encounter reader’s block from time to time? In my early years, I believed I had to finish every book I picked up just as I had to stay through to the end of every show I saw. That has changed in recent years. I will not waste time on what doesn’t work for me. Of course, I may pick up a book I’d set aside and love it a year later. What writers or artists have inspired you over the years? Oh my — so many. Too many to mention. Often it is not the author but a particular book that I fall in love with — the same for visual artists. A particular painting or sculpture could move me, but the artist’s work as a whole may not. My idols changed over time as did I. So while when I was very, very young, I was moved by El Greco — he does not work for me now. Giacometti, on the other hand, always has and I assume always will. The same for books; I can list those I’ve adored more than the authors themselves. Some writers spur me on to write- and I often pick them up when I cannot get started; others have me in such awe, I think I’ll never write again. Philip Roth’s voice falls into the first category; Anne Patchett’s Commonwealth the second. One of the most brilliant books I’ve every read is Siegfried Lenz’s The German Lesson written in 1948. It is all about the years of the Holocaust and never once mentions it. Emotions do have a definite impact on whether or not someone can be successful as a writer. Do you agree with that? I would never judge who is or is not a writer. For me, emotional content is everything. Without it I lose a relationship to the page. But it cannot spill out indiscriminately. I can only compare it to theater and film. We are moved far more when we see actors try to control their emotions than when they just let them fly. In “I Was There All Along”, you mention a lot of time spent in therapy. Do you recommend this type of self-examination and assessment for others? There is a strong belief — one which I too held for many years — that if one goes into therapy, one loses one’s talent. What that implies is that talent is the same as neurosis. I can no longer believe that. Therapy affected my life, not my art. How did writing your first book change your thought process? I learned always to keep the reader in mind. Here too it depends. Sometimes it is the opening — though one writer friend says endings are my nemesis. Clarifying for myself what I am trying to communicate, then staying on track. How do you “unplug and recharge” yourself? Everything from spending quality time with friends to vegging out in front of the TV. Then every so often — a “get out of town” trip to somewhere, often anywhere. What engages your sense of wonder? People. They never cease to amaze me. Any additional wisdom you’d like to offer? Already with rave reviews, “I Was There All Along” by Margo T Krasne is available on Amazon Books, Amazon Kindle, Barnes & Noble and soon to become a Nook book selection. Be sure to visit her personal website at http://www.margotkrasne.com and she welcomes all feedback and questions.